By all accounts, pro triathlete Heather Jackson is poised to become the first American woman to win the IRONMAN World Championship since 1996. Her third-place finish last year sent a message to her female competitors that she was one to watch at this year’s race. The Princeton hockey team captain and former Team USA track cyclist is known for her fierce competitiveness, huge smile and punk-rock look. Indeed, she and her husband, Sean “Wattie” Watkins, have segued her edgy style into a highly successful clothing brand and racing team, Wattie Ink. 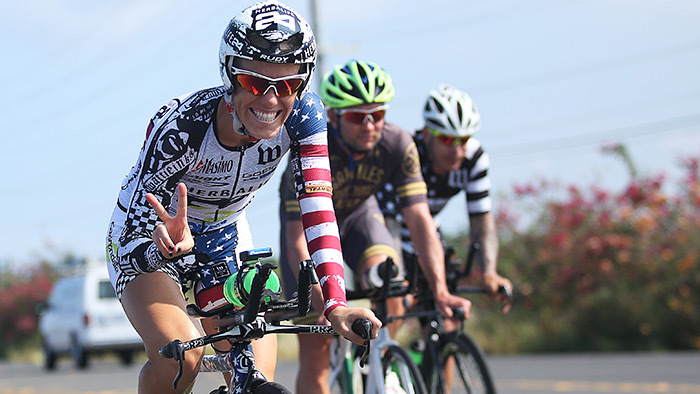 After her fifth-place finish in 2015, Jackson amicably parted ways with her coach of three years, Cliff English, and began training under the guidance of fellow pro (and fellow Wattie Ink teammate), Joe Gambles. The fresh take on her training proved to be a smart move—she went on to crush the IRONMAN Lake Placid female course record in 2016 in a time of 9:09:42 and followed it up with her bronze-medal performance in Kona in a time of 9:11:32. Having a coach who is often doing the same race as Jackson, and at the pro level, has been an entirely new experience and rewarding in many ways. “It’s helpful to be able to explain how I struggled through a certain section of a race course and have my coach totally understand because he was riding it too,” she says.